A friend's father's brother's nephew's cousin's former roommate recently moved to New Zealand and sent this snapshot home. 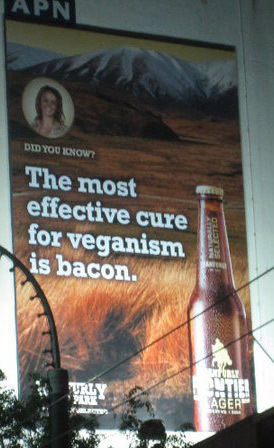 Sadly it doesn't mean that there is a brewery that actually sells bacon beer, but I think it's great. Further research shows a few more similarly themed ads and a commercial. Check it out below.